Sole/Ride: The sole may look the same but there has been one major improvement. 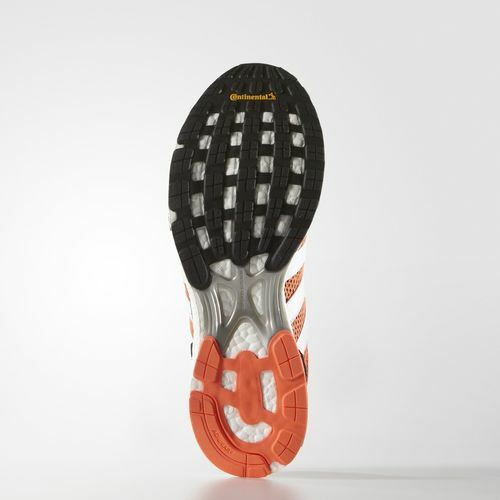 The addition of minor lugs to the forefoot outsole not only give the shoe better traction, but the forefoot feels more cushioned and responsive. At times the front of my feet could get a little extra sore running long miles in the Adios Boost 2. This issue has been fixed fairly well upon initial impressions with more protection and the lugs feeling like they give more pop to the forefoot. There are still several things that frustrate me and hold this shoe back a bit. The excessive toe spring introduced in the Adios Boost 2 is still present, which for me detracts from the ride and makes the shoe feel slower (See Thoughts as a DPT for more). 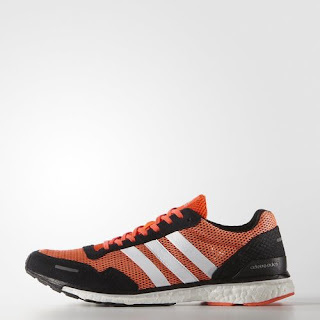 This was not present in the Adios Boost 1 or Adios 2 and those both feel like faster shoes. The midfoot sole, despite little change to the fit of the upper, has been narrowed more compared to the previous version and continues to make this shoe unstable. Finally, there is a slight protrusion posteriorly at the heel of the shoe, which does make it feel like initial contact comes a bit early, but the curved heel does make up for this somewhat. The last thing that's a little sad/concerning is that I don't see, feel or see reports of the extended forefoot torsion system that I have absolutely loved in the adios series. This is one of the major features that added amazing responsiveness and propulsion to the previous versions and what used to make the Takumi Sen/Ren so awesome (I was very disappointed when the extended forefoot torsion system was removed from those as well). 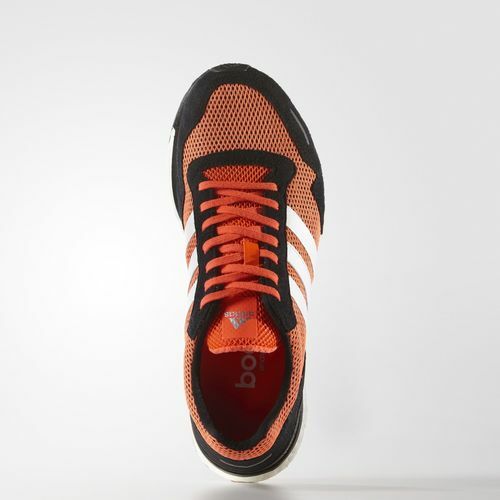 The shoe is still responsive and fast due to the boost and forefoot lugs. However, it does feel a little different than previous versions. Overall this continues to be the fast long distance racer that one would expect the Adios series to be. There is plenty of cushioning to use this up to the marathon distance and beyond or for training/workouts for those used to lighter shoes. I am curious to hear from anyone who uses these on trails as I think the lugs would perform well giving additional traction (I have not tried them there). Upper/Fit: The upper overall has improved on the Adios Boost 3 vs the 2. Version 3 fits fairly true to size and with normal thickness socks you should be able to go with your normal size (as opposed to sizing up with version 2). There is a wider fit throughout the forefoot, although the medial and lateral sides continue to taper much faster than I would prefer. Those with narrow feet should be aware that they may have to tighten down the laces a bit, but will have plenty of room for there toes. The scratchy upper from version 2 is still present although to a much lesser degree. However, running without socks is NOT recommended. That being said, the upper overall is much more flexible than the previous version and molds to the foot better without being stiff and tight like version 2. The heel counter is slightly less rigid and aggressive and feels better on calcaneus and achilles (whereas it felt really hard on the back of the foot at times with the Adios Boost 2). I am VERY happy Adidas kept the split heel stab giving room for the achilles tendon. So many shoes, especially racing shoes, are going with the non-split/rounded heel tab, which has on many occasions given me blisters or irritated my achilles tendon (the worst was with the Asics DS Trainer 20 (REVIEW) where I actually ended up injuring my left achilles). Thoughts as a DPT: As I mentioned earlier, the excessive toe spring is still present and quite noticeable. I have discussed this before, but excessive toe spring leads to a decreased use of the forefoot rocker which in turn can lead to decreased use/utilization of the calf muscles. This is great if you have tight calves, lack ankle motion or are prone to injury. Most of the time that can be treated with appropriate stretching, mobility and strength work. I say most for a reason as there are some individuals that may have lost their own forefoot rocker due to lack of mobility in the metatarsophalangeal joints. This may come from a variety of conditions. If is not treatable with the previous things I mentioned, then toe spring is great because it allows you to get forward moment. Trying to get over stiff MTP joints can cause a great deal of issues and compensations higher up the chain. The forefoot, ankle and heel rockers are all important for helping to progress the body forward over the foot. Missing one can cause big issues and then yes you can substitute. But you will be missing the muscular contributions. So for those without this issue, toe spring isn't all that needed. The trade off is that later on in longer races when your calves are starting to fatigue, yes this would help. The Adidas Adios Boost 3 is designed as a marathon shoe, so that makes sense. Given that, I still don't like the idea of excess toe spring as not only does it replace the forefoot rocker, it holds the toes in extension. This can place excessive pressure on the plantar fascia as most people do not have enough great toe extension to begin with. A common compensation for that is the great toe starting to point laterally... which places excessive pressure on the medial side of that joint... and that's how you get bunions! So if you want to use a shoe with that much toe spring, at least make sure you stretch and mobilize that first MTP/toe joint! I've hounded on narrow midfoots before. This comes from making a shoe with a last that is very curved, which is great if you are one of the rare individuals who supinate. The last shape provides minor resistance and support to anyone who collapses in the lateral direction. For those who collapse or pronate (which is normal and occurs in a majority of the population. The amount differs depending on appropriate mobility, strength and flexibility), having a straight lasted shoe (shoe shape is straight) is what provides stability. So for those high arched, stiff footed runners, this will be a great shoe. For those that may have more flexible or weak arches, be wary that you may feel some soreness in a shoe like this with the midfoot so narrow (and thus more unstable). It doesn't mean you can't run in this shoe. It means you should be especially sure you work on your arch strength, single leg balance and hip strength! Conclusion: Despite the amount of writing above, I do still like this shoe. I appreciate the increased room in the forefoot (despite that fast taper), the slightly more flexible upper and the awesome protection and responsiveness in the forefoot. The toe spring is a little much (which those with stiff joints in their forefeet may enjoy), the midfoot is a bit narrow, leading to a bit more instability and the apparent lack of the extended forefoot torsion system may reduce the amount of pop this series used to have. However, this still remains to be a good fast and responsive shoe that is fantastic for longer races and workouts. There is plenty of protection from the boost and new forefoot outsole and the shoe is light enough to get some fast miles in. Is it one I plan to keep? No. I have already returned this shoe to Running Warehouse. I think the issues stated above are enough for me to pass on this version but I am still considering grabbing a pair of Adidas Adios originals which still have all the aspects I have loved in this series. For those that are looking for a long distance protective racer, definitely consider the Adidas Adios Boost 3. Disclaimer: These shoes were a personal purchase from Running Warehouse and were returned. I did run briefly on the road with paces ranging from easy running to all out sprinting to test the shoes out but no more than what I would do testing shoes at a local running retail store. My thoughts are based on 7 years working in running specialty stores and experience with more shoes than I can count. If I ever receive the shoes for free I will put them through their full paces, Due to financial reasons I had to return these to Running Warehouse. Keeping a pair will have to wait until I am able to start my job as a physical therapy licensed applicant in August of 2016. As a graduate student with little money I have to be careful with my shoe purchases. *Unfortunately I sent the shoes back to Running Warehouse before getting photos so images were obtained from the Adidas Running website.